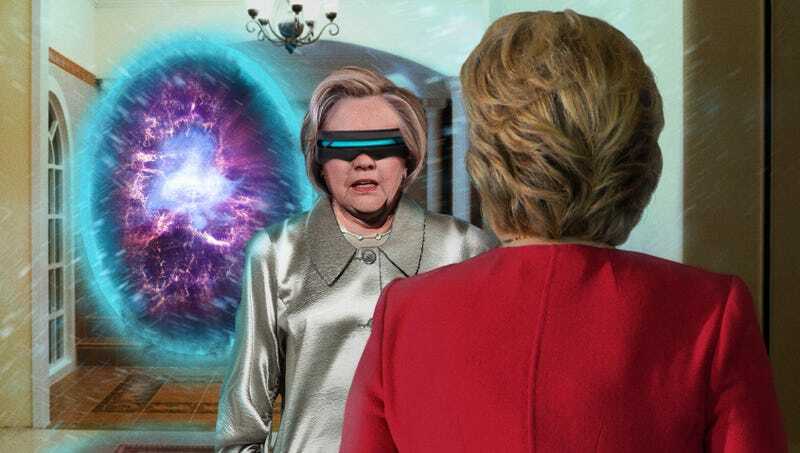 HEMPSTEAD, NY—Bursting through the glowing space-time portal backstage just before the first debate of the 2016 presidential election, a frantic time-traveling Hillary Clinton reportedly warned her past self to do everything in the exact same way. “Listen very carefully because we don’t have much time: Make sure you do everything that you’re already intending to do,” said the future Clinton, passionately urging her year-younger self to execute her current campaign strategy precisely as planned. “Now this election is going to have a lot of unpredictable moments, but, no matter what, you must change absolutely nothing—remember, no matter what the end result, you did everything right.” At press time, present-day Hillary Clinton was being counseled by 2020 Hillary Clinton on the grave importance of not doing anything differently if she wanted to lose again three years from now.